DEADLY DUST: The cycles of algae blooms known as red tides that are plaguing the Gulf of Mexico have their origins half a world away, rising out of the Sahara in Africa. While the blooms have existed for millennia, the cycles have been happening with more frequency and intensity, say Rochester alumni who study red tides and their impact. While the harmful algae known as red tide have historically been common in warm waters like those of the Gulf of Mexico, the troublesome blooms are no longer seasonal. The algae kill marine animals and make life miserable for beachgoers. A particularly robust cycle that began last fall prompted Florida Governor Rick Scott to declare a state of emergency this past summer for seven counties in southern Florida. Michael Parsons ’90 and Michael Savarese ’81, ’84 (MS) are leading an effort to study red tide and determine what can be done to mitigate its effects. As researchers at Florida Gulf Coast University, they analyze the blooms and environmental changes in coastal settings, particularly in response to human development, sea-level rise, and global warming. When algae grow out of control and produce toxins harmful to humans and wildlife ecosystems, they are called harmful algal blooms (HABs). Red tide is just one type of HAB, common in the Gulf of Mexico and characterized by explosions of single-celled algae called dinoflagellates. Each cell is about the size of a grain of salt, but when concentrations become greater than 100,000 cells per liter of water, the harmful algae can severely lower oxygen levels and give water a reddish or brownish color. What are the effects on humans? Poor water quality can exacerbate the problem, but red tide algal blooms actually form far offshore, triggered by a natural cycle. 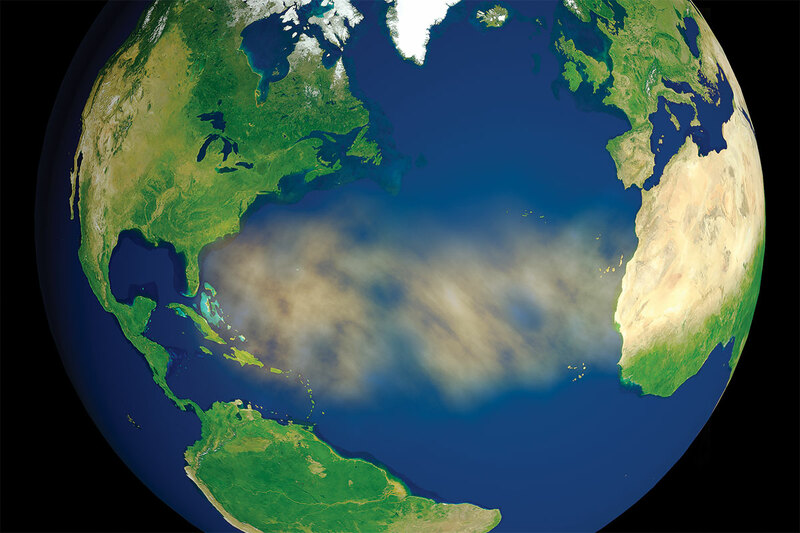 Iron-rich dust from the Sahara scatters into the Atlantic Ocean and fertilizes the water, creating ideal conditions for dinoflagellates to thrive. The Florida coast is fairly shallow until about 100 to 200 miles out, where the gulf drops into extremely deep water. When those deep waters rise up toward the surface, they can bring in new nutrients that further feed the red tide. Why was red tide so bad this year? Warmer waters are just one of a “perfect storm” of factors contributing to the intensity of the current red tide, Parsons says. Other factors include more persistent winds blowing offshore blooms inland and “legacy” nutrients—litter, fertilizers, and wastewater runoff—from Hurricane Irma, which hit Florida in September 2017. Red tide used to be more common in the winter, but even that’s changing: the current red tide has been a continuous presence in Florida since October 2017. “I don’t know when red tide season is anymore, and the reason I don’t know is scary: there seem to be red tides year-round now,” Savarese says. With this bleak picture, is there any hope that the red tide may go away any time soon?